2) Control of the identified asset is transferred to the lessee. a. An asset is deemed to be identified in a contract if the contract specifically describes or defines the physical asset to be utilized in performing the service. So if the contract states that the vendor will provide transportation services to the purchaser using a truck with vehicle number 123456789, then that truck is deemed to have been explicitely identified in the contract. Please note, however, that if the vendor has the “right of substitution,” that is, if the vendor can substitute the truck with another one without the purchaser’s consent or approval, then the truck is not really identified. Put another way, if the vendor has the ability and the right to provide the required services by using an alternative asset other than that which was specifically described in the contract, you do not have a lease. Note that Contract terms that allow or require a supplier to substitute other assets only when the underlying asset is not operating properly (e.g., a normal warranty provision) or when a technical upgrade becomes available would not create a right of substitution. b. An asset is also deemed to be identified in a contract if the only way the vendor can fulfill its obligation under the contract is by utilizing a specific asset. This is called implicit identification. Using the transportation example above, if the vendor is required to provide transportation services to the purchaser, but only has one truck, then that truck is deemed to be identified in the contract, even if it is not mentioned at all. b. Derive the benefits from the use of the identified asset. a) Directing use: At risk of oversimplifying this concept, the easiest way to think of this is that the purchaser can determine “who, what, when, how and where” as it relates to the asset. Basically, the purchaser can direct who operates the asset, what the asset is used for, when the asset is used, how the asset is operated and where the asset is utilized. b) Derive almost all the benefits from the use of the asset: The purchaser should be able to obtain substantially all of the potential economic benefits from the use of the asset during the contract term. The customer can obtain economic benefits either directly or indirectly through the asset’s primary outputs (i.e., goods or services) and any by-products (e.g., renewable energy credits). However, other tax benefits, such as those related to the ownership of the asset, would not be considered economic benefits of use. So if during the term of the agreement, the truck is used to transport only the purchaser’s goods, then the purchaser is getting almost all the benefits from the use of the truck. 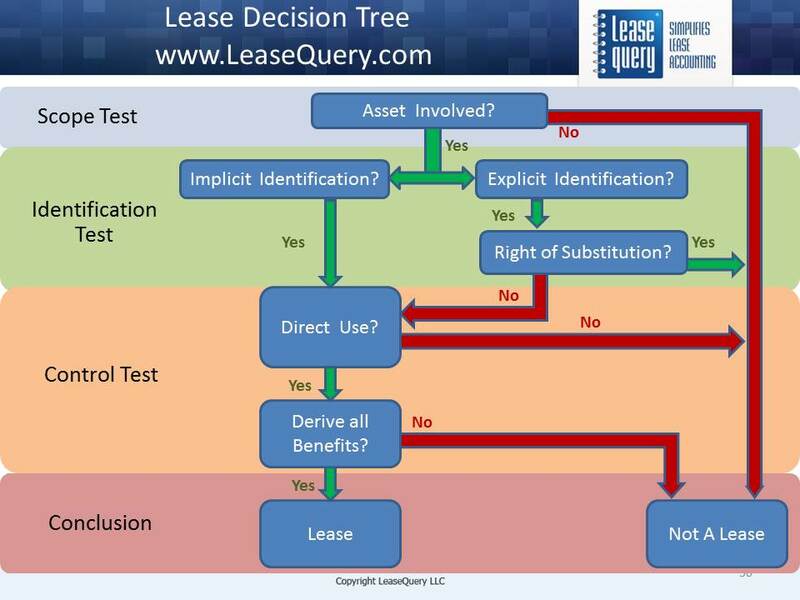 Lease = Identification (Implicit or Explicit without right of substitution) + Control (Direct use AND Derive all Benefits). Now that we understand when you have a lease, let’s get back to my colleague’s question at the beginning of this blog: how to account for “leases that are stadium naming rights.” Analyzing the agreement, is there an identified asset? Most likely, stadium is specified in the contract. So yes. The identification requirement is met. Let’s move on to the second requirement: Control. Does the purchaser direct the use of the stadium? Do they say “who, what, when, and how?” The answer here is likely “No.” The purchaser of the stadium naming right does not direct the use or manage operations of the stadium. They simply pay for the right to have their name displayed. As a result, most stadium naming right contracts do not contain embedded leases.